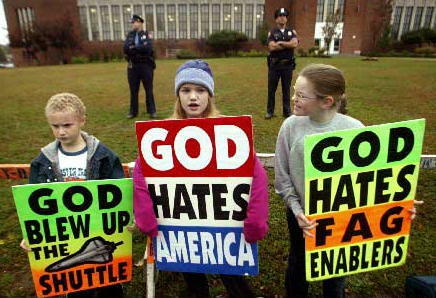 When they show up outside of our public schools or… when they show up across the street from a funeral of fallen soldiers or… when they place signs like this (shown in picture) in the hands of children or… when they get press coverage for speaking out in the name of a loving God in a way that shows God to be anything but. They are the Phelps clan from Westboro Baptist in Kansas, and they… are anything but. A few years ago, one of our local radio talk show hosts had one of the family members on and allowed them to take calls from listeners. It was an incredible hour or so of radio theater as the family member spoke with such a condescending tone to the audience. Asking questions of her was like asking questions to a wall covered with hate graffiti. No matter what you say to the wall, those words were all that stared back. Plus, walls don’t listen. At first, I got angry at what I was hearing. As a Jesus follower, these words and the tone in which they came, did not reflect mine. As a believer in Jesus, I am called to love. It is the greatest of commandments. …judging is not. Making blanket statements like these people do, scare me. Even children know that if you are going to build a Kingdom… you don’t hate people into that Kingdom… you love them. Sadly though, it is because of people like this, people judge Jesus not on who He is, but who they are. One glance of the life of Christ should lead us to a point of understanding that these people don’t reflect Him, they reflect a heart that is filled with hatred and is skewed by their own disillusioned thoughts of their role to enlighten the world of God’s wrath. What the world needs to know about is… God’s love. Sadly though, they are not accountable to anyone, but someday… they will be. That’s not my call. I’ll leave that one to the very God they speak of. I love in the video when Hannity asks her of her sins and how she avoids the question. Oh how easy it is to point fingers at people you don’t know, when you are not willing to point them at yourself. Too often, we as Christians move too quick to get in the way of God. I recall after 9/11 how spiritual we were getting. It really seemed that something supernatural was happening in the wake of such a dark moment in the history of our world. And yet, instead of waiting on this “moment” to come to fruition as the hearts of people were being so deeply moved, some of our TV evangelists decided to take it upon themselves to make judgement calls as to perhaps why America had suffered such an attack. It was incredible. You could almost immediately feel this supernatural moment evaporate over night. When will we ever let God be God? In the case of Westboro Baptist, they have given themselves the role of jury to the Judge delivering guilty verdicts before anyone has even been tried. Sadly, the darkness of their hearts clouds their view of the real stories that make people who they are. No matter who you are or how you live, we all have a story and we all have things in our past that have shaped who we are today. Some good and sadly… some bad. Sadly, these people do not understand this. They don’t care about people because they don’t want to listen to people. They don’t care about people because they don’t care about hearing their stories. They don’t care about people, otherwise, they would shut up, kneel down, and clean the very feet of those they cast judgement upon. Sadly, I cannot take them seriously. But, what I do take seriously are the very ones they have “judged” as well as the very hearts of those children who stand across the street holding signs of hate… when they don’t even know it. To hear the contrary to Westboro Baptist… listen to this from my pastor, James Gleason. Click here for his message called… Here comes the judge. Such a good post! And I can’t agree with you more!